By day a West London physio, by night a place for relaxation and harmony! Unlike Spiderman who spends his evening fighting crime and keeping society safe, Body First is focusing on a more peaceful evening past time. This Valentine’s day BODY FIRST UK are bringing back our famous couples massage offering. What is more, is that two lucky people will have the massage for free! Nothing says love like the gift of relaxation. Help ease away the pressure and stress of a modern-day London life by treating your loved one to a calming massage. This shared experience enjoyment will be heightened by being in the same room and you can then both float away hand in hand afterward. Need any further convincing of the benefits of a couples massage? Read these three reasons and look no further. Increased feelings of affection. Relationships are built on closeness and research has shown that a couple’s massage is particularly effective are accomplishing this. Massages release oxytocin and dopamine and when couples benefit from this chemical reaction at the same time all the stress and worries will have been removed. This shared experience is a great way to form bonds that create memories that in the future we can look back on with affection. Simplicity – You don’t have to jump on a flight to Rome and be pictured falling into each other’s arm in front of the Colosseum to enjoy each other’s company. In fact, sometimes simplicity is the ultimate sophistication. A couple’s massage which is not far from home keeps the logistic of the evening simple. No complicated plan – just relax for the hour and then drift home together. Reduce anxiety. This one is not linked just to the couples massage, but every therapy you will ever have. Massages are famous for relieving tension and anxiety. Looking for a loving and caring activity for this Valentine’s Day? Reset your emotions and share a bonding experience that will leave you both feeling relaxed and happy. Our couples massage West London is always a popular treatment so contact us now to book and avoid disappointment. 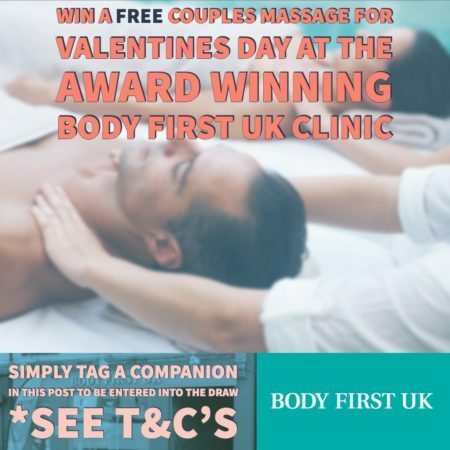 Win a FREE couples massage, West London, this Valentine’s Day. All you need to do is tag a partner on our Facebook post to enter. Share the post and you will be entered into the draw twice! T&C’s in the comment section. Entries must be made on the BODY FIRST UK Facebook page. BODY FIRST UK is a West London physio, based in Hampton.